In the near future, about 60 or so people are going to be getting the Galcon 2 box set. One of the goodies is a set of marbles to play the Galcon Marble Game! I designed this game this month and I’m posting the rules here as part of the #1GAM for February. – Dominate the Galaxy with your Marble Shooting Skills! – 4 sets of 7 planets (small marbles). – 1 shooter (large marble). 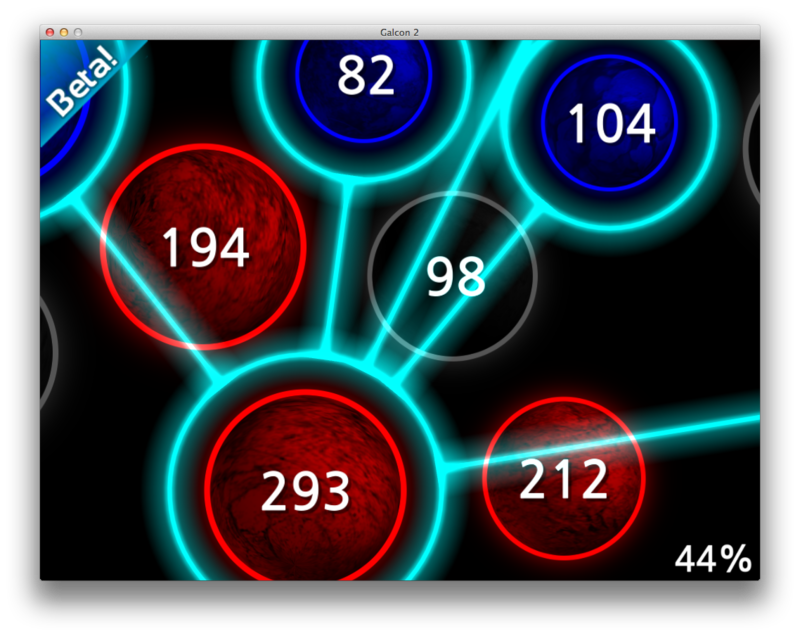 – In order from highest online rank to lowest, each put down a single planet from your set until all planets are placed. – Pick one of your planets as your starting point. – From there, shoot the shooter. – If you get an enemy planet out of the Galaxy, you get a bonus turn. – If you got one of your planets out of the Galaxy, your turn ends. – If you get no planets out, your turn ends. – You are allowed to knock your own planets around if you want to, but you may not shoot at the planet you are starting from. 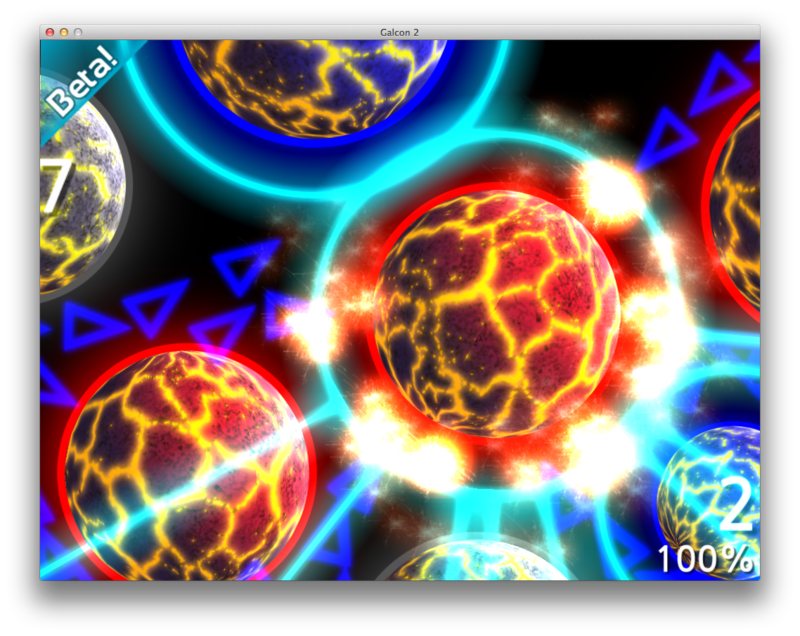 – Knocking out multiple enemy planets in a single shot only gets you one bonus turn. – No matter what, if you knock one of your planets out, you don’t get a bonus turn. Have you ever wondered how marbles are made? I bet you have. Here’s a video of Shannon “Snoop” Norris of Fireworx Glass Studio creating the Grand Admiral reward art glass marbles. They came out incredible, but they are near impossible to photograph because they are all 3D-inner-reflective glass stuff. I’ve been a bit busy the last few days working on Dynamite Jack for Android. This helps out Galcon 2 a ton, because now I’ve got a wrapper for Android that will work with Galcon 2 when I’m ready for Android porting time! 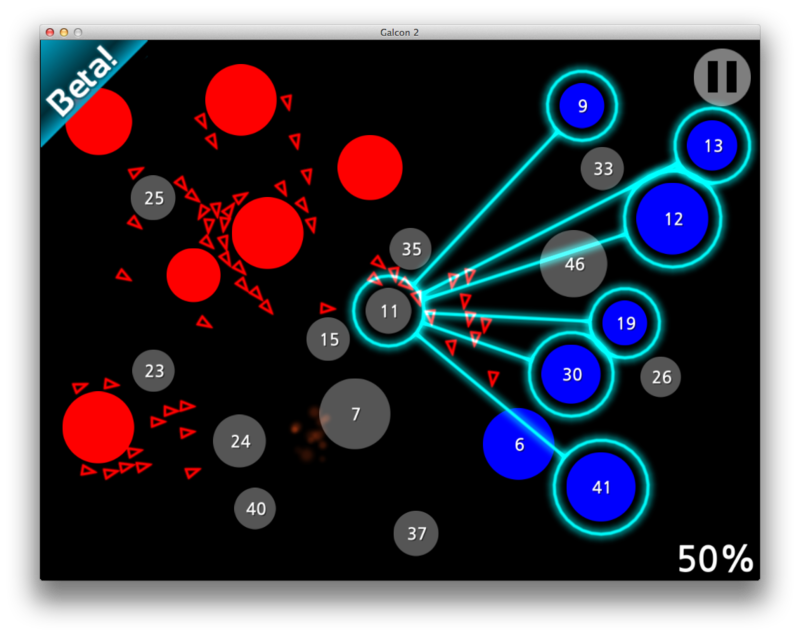 I’ve also put together a beta3 of Galcon 2 that includes several new mods I made, a “Turn Based” mod and a “Bot War” mod. I’ll have some details about the API changes in the forums for the modders, I’d really like to include some user mods in a build in the near future! Download beta3 for Windows or Mac. Please leave some feedback on the forums! – Created an object-oriented Lua style wrapper for the modders! 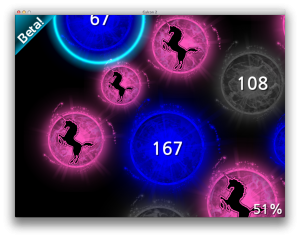 – Fixed a few other minor bugs. It takes a bit of digging around in the forums right now, but for the brave, there are already some really cool mods getting made. So check those out too! The week started out pretty bare. The planets were completely invisible. Ever wonder why I haven’t added “black planets” to the game? Got a basic texture on the planets. A nice zoom in shows some detail. This is one of the Galcon Fusion textures. Messed around with crazier styles and pink unicorns. I bet there’s going to be a Unicorn Clan in Galcon 2. 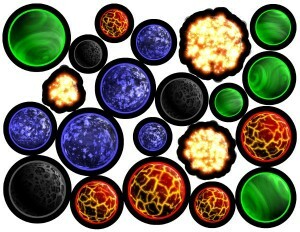 And spent days and days making some really cool planets for the magnet set I still have a bit more work to go yet. Most of that cool crazy planet stuff isn’t in the beta right now. 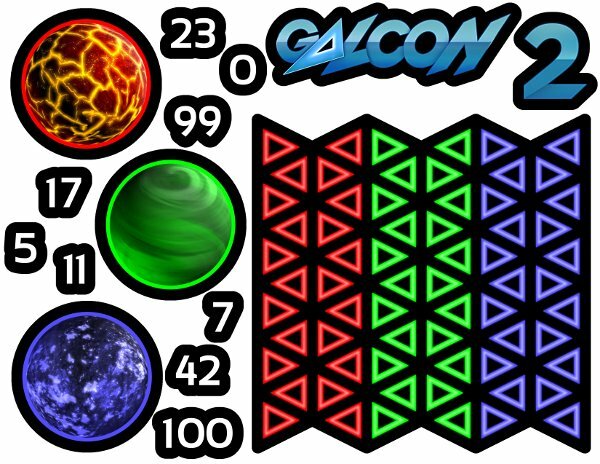 Lots of those things are going to be sold as “cosmetic upgrades” for Galcoins in the game, and right now I really want to focus on making a solid core game. So for now, the planets have been upgraded from the plain circles, but nothing too fancy yet! Have fun, and thanks for being part of the Galcon 2 beta! P.S. Oh yeah, the whole point of all that is: I’ve been working on the planet rendering for the fridge magnet set! I’m almost done! There are 101 pieces to the fridge set right now! 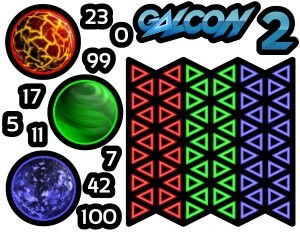 I originally was going to do just a single 8.5×12 sheet, but decided that Galcon 2 is so epic that it DEMANDS two 8.5×11 sheets of fridge magnet awesomeness These are getting pretty close to what the final art is going to look like. 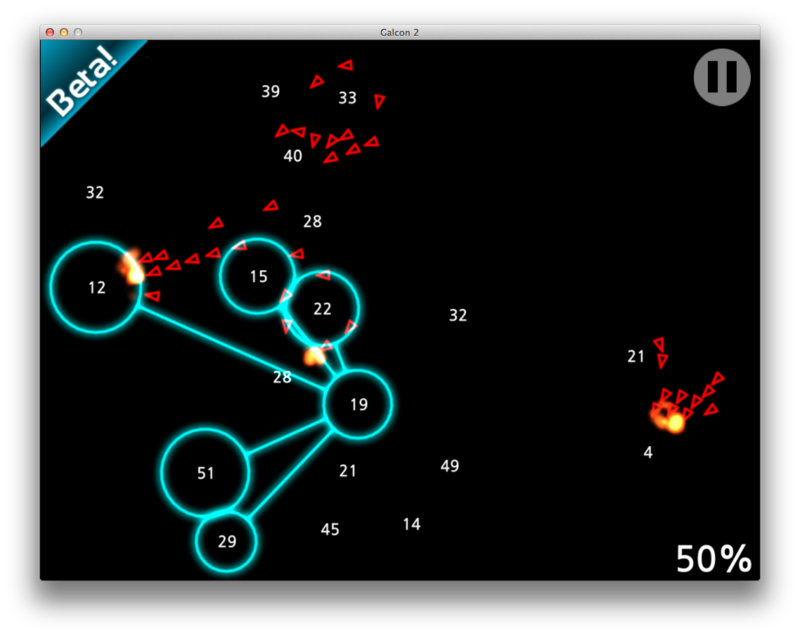 Galcon 2: The beta has begun! Okay folks! The game is ready for beta-madness to begin! Check it out here. You’ll need to download the game, create a GALCON.COM account (if you don’t have one) and then activate your account to play. 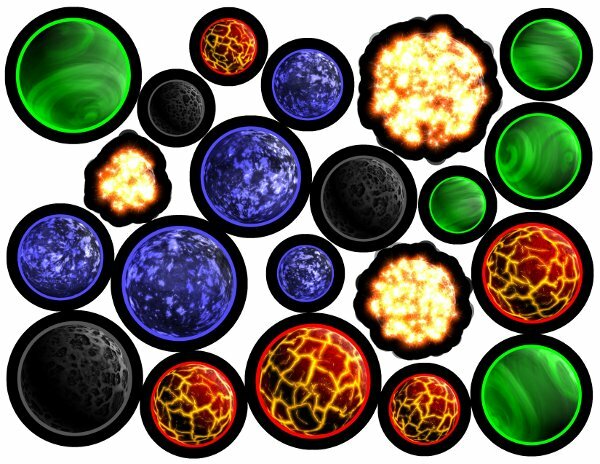 – Try different options in mod_classic, you can have huge maps with tons of planets! – Do the classic controls work good for you? – What do you think of larger maps, scrolling, zooming, etc? – What did you think of the modding API? And, as always, just talk about whatever and we’ll see what comes next in Galcon 2! Posted in galcon2 | Comments Off on Galcon 2: The beta has begun! 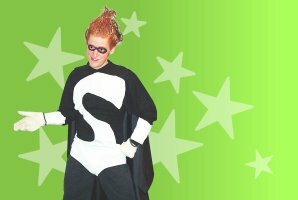 You are currently browsing the Phil Hassey weblog archives for February, 2013.